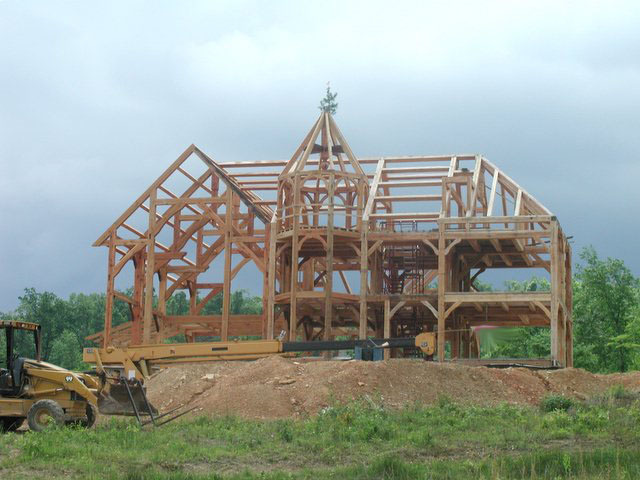 Restoring a classic timberframe barn. A good neighbor recently told me of a timber frame barn that has been slated for removal. In fact, he said I could have the barn if I would take it down and remove it from the property. I've chased down similar leads from others before, and those all turned out to be duds. In spite of my skepticism, I drove over an hour on back roads to see if this barn was for real, and really worth saving. When I found the barn, I was pleasantly surprised. For starters, the timbers, the rafters, the roof sheeting, and the braces are all solid oak. In fact I'm pretty sure it's made entirely of old growth white oak, which is one of North America's most rot resistant hardwood species. (Look at the quarter sawn patterns on the rafters and braces in the photograph at the right!) The barn is also a genuine dutch-style timber frame (i.e. 4 posts per bent, 3 aisles), of excellent craftsmanship, most likely built by German immigrants or early descendants given the date and location of the barn. It's had a good roof on it since it was built, as there is practically no water damage to any of the interior wood members. That's the good news. Now for the not-so-good-but-correctable news... Some of the timbers will need to be remade due to abuse and thoughtless remodeling by previous owners over the years. For instance, each of the classic-dutch tie-beams between the tallest two posts of each bent were removed many years ago to allow for installation of a hay trolley on the ridge beam. Surprisingly, the barn has suffered no distortion from that modification. But when the hay trolley was installed, the farmers got serious about storing tons of hay on the second floor, and several floor joists were warped or broken as a result. (When the barn was originally built, hay was probably stored loose, not in dense bales.) Also, 3 of the 24 posts will need some rework because the bottoms of them were hastily repaired to remedy decay at the foundation intersection. Finally, I noticed that one of the posts was snapped clean in two. When I inquired about it, I was told that eagerness to dismantle the barn spurred someone to tie a cable to their new 3/4 ton truck and tug on the barn. The truck gently pulled a wheely and the barn wouldn't budge. So the driver backed up to allow slack in the line and got a run at the effort. Fortunately for the driver, the airbags did not deploy, but the lone post snapped, leaving the rest of the barn standing as if nothing had happened. Now that's a testament to the integrity of German timber framed barns built of white oak. This one is surely worth restoring. The two story barn is currently 50 feet long (6 bents with 10 feet between each bent), but it could be easily shortened in 10 foot increments to say 40 or 30 feet. It is 32 feet wide, with the aisles spaced 12, 8, and 12 feet. The frame could serve as the basis for an awesome shop, garage, cabin, modest house, house addition, or of course a great livestock barn. I would love to put it on our farm, but we already have 5 barns... though none nearly as nice as this one! The barn was burned down this week... a piece of history (and a lot of good white oak timber! ), lost to lunacy. Stucco - the easy way? The onset of winter has greatly elevated our desire to seal up the exterior of our house. Most of the house is covered with SIPs (Structural Insulated Panels) - they are airtight and provide great insulation... no drafts there! But for one area of our house, we chose to try and replicate the older (European?) style of timberframing, by exposing timbers on both the inside and outside of the house. Making this section of the house weather tight presented a unique challenge. Ancient timberframes were infilled with all sorts of creative materials... cow manure, mud, and wooden lathe, to name a few. For energy efficiency, hygiene, and aesthetics we decided to try some more modern materials. For insulation, we used the same poly-iso foam panels that we used in the roof. For siding, we were going to do a traditional 3-step stucco process until I discovered some cement based stucco-textured panels at Lowes. These "HardiePanels" are made by the James Hardie company - the same company that makes "HardieBacker" sheets that are typically used for underlayment beneath tile floors. We reasoned that if we weren't happy with the final look of the panels, a few years down the road they would make a suitable base on which we could apply traditional stucco. I bought the pre-primed panels in 4x10 sheets. They were $36 apiece, so that worked out to be about $1/square foot (not counting paint, nails, and caulk). We did a final sanding of the exterior white-oak timbers and applied spar-polyurethane to them before installing the panels between them. Should you make a mistake with a paint brush or caulk gun, timbers sealed with polyurethane are much easier to clean than raw or oiled wood. I cut the first panel to fit "loose" within the timbers, so there would be about 3/16" of an inch gap in which I could apply a bead of flexible caulk around the perimeter of the panel. The caulk was expensive (over $5 per tube), but it was labelled "for use with pre-primed cement based siding," and allows 50% movement so I bought it. The consistency of the caulk was somewhere between thick latex paint and silicone and I found it hard to place consitently and neatly, but I started getting the hang of it. Actually I just decided to call my results "good enuff." I tried attaching the panels with the same screws sold for use with hardie-backer underlayment, but I found it hard to drive them flush without damaging the panel or stripping the heads, especially when working from a ladder. After a dozen frustrating screws, I switched to stainless roofing nails (left over from the slate installation and purchased from (http://www.jenkinsslate.com). They were much easier to drive flush, and don't rely on a coating to keep from rusting. My wife smeared cement based patching material over the heads of the nails. The texture was a good match for the pre-embossed texture of the panels and the cement material bonded tightly to the stucco panels. Although the panels were preprimed, it was necessary to prime the cementous material that hid the nail heads, so I painted primer over the entire surface. I figured it could not hurt and I was anxious to see what the panels would look like in place and one continuous color. By the way, the primer is specifically labelled for use over cement based materials. For the final coat of paint, we'll probably choose something close to the color of the mortar in our stonework. Throughout the project, we've usually had one or two people helping us ("inlaws and outlaws"), but we've slowed down a bit and now it's just my wife and I working on the house most days. (plus the dry-wall finisher) My wife has been running the crane, with me on the end of it (talk about excitement! ), in order for us to mount more of our solar panels. Since December '06, we had been operating the house site with just 6 panels. Now we have 24 panels on the roof. On a bright day, we receive 5,000 watts of power from these 24 panels! Of course we don't use much power up there, so our batteries have been staying full. Because we're not connected to the grid, there's nothing to do with the excess power. So as not to feel wasteful, we go around turning ON lights in the house when the sun is shining! (it produces a small amount of free heat which is useful this time of the year) To use our power more effectively, we bought the most energy efficient upright freezer we could find (527Kwhr/yr. for 20.6 cu ft., manual defrost) and moved it into the pantry yesterday. This will let us unplug a not-so-energy-efficient deep freeze that we had connected to the grid elsewhere on the farm. ...This is the actual color of blue that our oldest daughter chose for her room. Very bright! The highly-figured upright post in the center-left of the picture is hard maple.